I found the recipe for this cake in GoodHouseKeeping Mar09 Issue. The original recipe is for strawberry shortcake.I had baked the cake y'day and thought of using the strawberries that i had frozen during summer for frosting . But when i saw the thawed berries in the afternoon i didn't felt i using it . 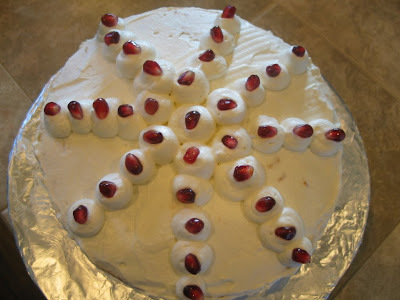 Then i saw the pomegranate in the fruit basket and decided to use it instead.Since the seeds are pomegranate is something i don't like much so just used it for decoration and in between two layers of cake i used reduced POM juice. 1. Position rack in the center of oven and preheat oven at 350 F.
2. Grease two 9 inch round cake pans dust with flour, tapping out the excess set aside. 3.1. From Orange grate 2 tbsp peel and 3 tbsp juice. 3.2. With electric mixer on medim high speed beat butter until pale yellow. 3.3. Add sugar and beat until light and fluffy. 3.4. Reduce speed to low,add flour and mix until just blended. 3.5. Add orange peel,juice and one egg at a time,beat well after each addition. 3.6. Divide the batter into equal portion into the prepared pans. 3.7. Bake 25 min or until toothpick inserted in the center comes out clean. 3.8. Cool cakes in pans on wire rack for 20 min. 3.9 Invert layer onto racks ,carefully peel off the wax paper and cool completely. 4.1.In a pan reduce the POM juice to half and set aside to cool. 5.1. In a bowl whip cream with vanilla and sugar . 5.2. Place a layer of cake ,rounded sides up and spoon the reduced pom juice . 5.3. Spread quarter of whipped cream over it. 5.4. Top on with remaining cake layer. 5.5. 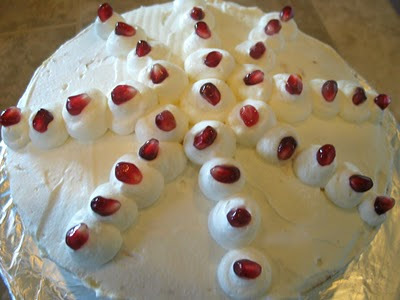 Spread half of pomegranate seeds and rest of remaining cream. 5.6. Garnish with pomegranate seeds. 5.5. Serve immediately or refrigerate upto 4 hours before serving. "Show me your cake" at Dil Se. lovely cake.... looks pretty. thx for contributing your recipe! wow looks awesome and so perfect,very delicious,wish i could have one piece...:)Wishing u & ur family Happy New Year!! Congratulations Nisha..Just saw it at RV's that you have won! The Cake looks so delicious and perfect..Congrats Nisha :-) First time here..
Congrats of being the winner for Food for 7 stages of life. That's a lovely recipe. Congrats on winning the Food for 7 Stages of life contest. Lovely recipe . I was just glancing through your desserts & this caught my attention. Looks fabulous. If you are willing to, you can send this recipe or any other sweet & romantic recipes to my ongoing ''Valentine's Day Event'' :) So glad to follow your fabulous blog!